New for September 2006! RF probing is an awesome way to measure the response of very small devices, while not harming them! Reed Gleason invented the first high-frequency wafer probes with Eric Strid in 1980 while working at Tektronix, and co-founded Cascade Microtech in 1983. This company basically started an entire industry. Before RF probes were available, there was literally no way to test MMIC devices on wafer, or for that matter, without mounting them, wirebonding them. So there was no way to produce known-good die for assembly. Thanks, guys! This is reason enough to put them in the Microwave Hall of Fame! Early RF probes used coplanar ceramic feeds, which where not very forgiving if they were lowered just a few mils too too far (ceramic doesn't bend well!) Today many styles are available, probe stations are more elaborate, life just keeps getting better. The first probes covered up to 18 GHz. Now easily cover up to 110 GHz! De-embedding techniques had been developed prior to probing, and often used break-apart test fixtures with standards that had to be wire-bonded to the fixture halves. Some day we'll try to post some of the math that is used in de-embedding measurements. Anyone care to help us out? 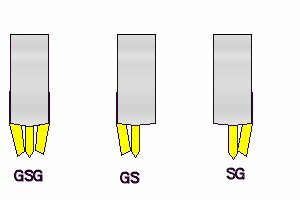 Ground-signal-ground is the most common type of RF probe. This is similar to coplanar waveguide. Ground signal probes are also available. This probe would be needed if your RF circuit only had one ground pad. Why would you do that? On GaAs, every square millimeter can cost a dollar or more in high volume production. Probe pads take up area, they cost money. In order to make the lowest price product, sometimes that second ground pad doesn't get past the final design review. TriQuint seems to have the most diverse probe patterns of all of the MMIC suppliers. Here's three amplifiers we borrowed from the TriQuint web site. 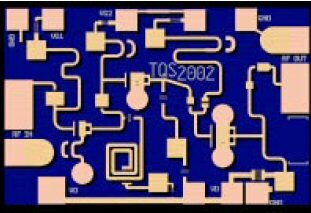 Here's the TGA4042 Q-band amplifier, it uses ground-signal-ground probe pads at input and output. 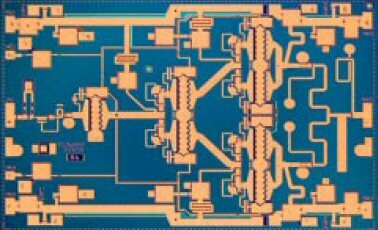 Here's a TGA2501 6-18 GHz amplifier. It uses GS on the input, and SG on the output. 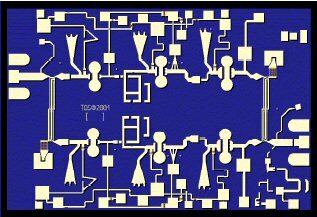 And here's a TGA4506 Ka-band amplifier. It uses GS on both sides! We don't recommend using anything but GSG at this frequency and above, even if the TriQuint cowboys do it routinely. Those TriQuint production testers must be kept very busy swapping probes back and forth with every wafer that comes out! So what happens if you mix up a GS probe with a GS probe? When the signal and grounds are swapped, you get bad data. For example, gain measurements (S21) might be 20 dB low! Most RF probes are 50 ohm impedance, as is almost all microwave test equipment. However, sometimes high-impedance probes are used in order to "sniff" out the performance of a circuit without loading it down. 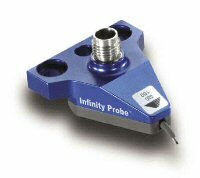 Differential probes are also possible, and dual-signal probes (SGS) are too. Can't say we've ever seen either of these. After RF probing and the wafer is diced, when you sort out the parts that met spec, these are the KGD. This is the distance between center-to-center of the probe tips. 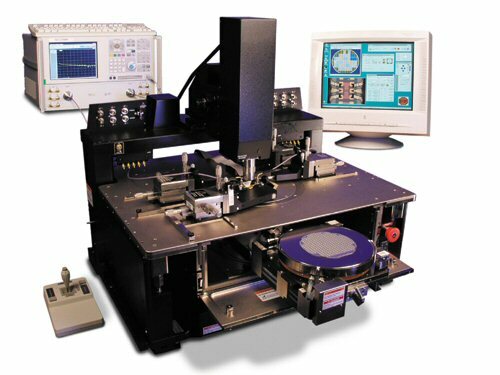 Typical values are 150, 250 microns, but a range of 50 to 1000 microns is possible. 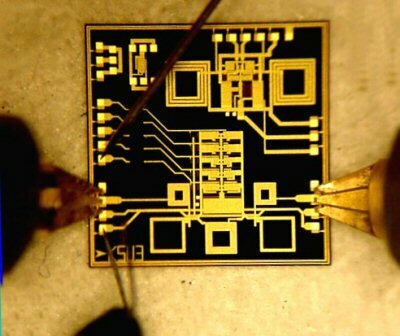 The larger probe pitch is not practical for millimeter-wave frequencies. When you adjust the Z-axis of a probe, just as it comes in contact with the DUT it will start to move in the Z-Y plane as it flexes. You want the probe to skate probe just one mil (25 um). This is usually accomplished by overtravel of 2 mils (50 um). These images are used with permission of Professor Kuhn at Kansas State. Thanks! De-embedding means to mathematically remove the effects of external transmission lines in order to arrive at the true vector S-parameters of a device that is not connectorized. The opposite of "de-embedded" is not "un-de-embedded", it's "embedded!" And please don't spell the word de-imbedded, that's just wrong! OK, this section is lame, we'll work on it.